From left to right: Lucy Robinson, Charlie Ashman, Amy Beams, Maisie Rudkin, Mary Rook, Jo Chaplin, Katie Loates, Jill Horn, Libby Greenhalgh and Dee Caffari, MBE. 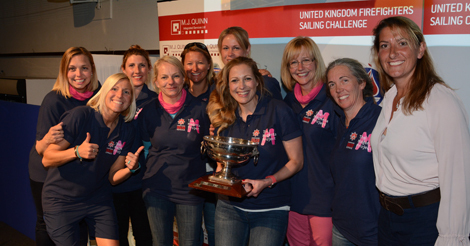 A team of fire service women made waves with their debut entry in the United Kingdom Firefighters Sailing Challenge (UKFSC). HFRS Magenta placed first out of all fire service boats, second overall and first Hampshire boat for the race passage home. The all-female crew made up of firefighters and non-uniform staff from Hampshire Fire and Rescue Service (HFRS) took to the water in a 40ft Sunsail sailing yacht, competing with 29 other crews in a record year for the fundraising event. Their competitive edge and support from The Magenta Project, in the form of a trio of elite sailors, saw them sail to victory this week (Thursday 11 May) taking the coveted UKFSC cup home. Among these renowned sailors was Round the World navigator and meteorologist Libby Greenhalgh. She said: “It is great to see women from the fire service flying the flag for inclusion and diversity and showing that gender is not a barrier. 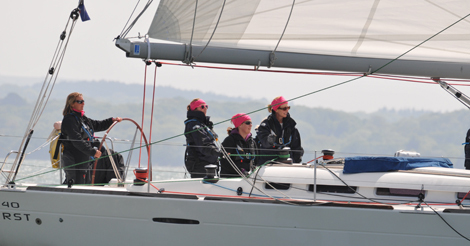 “The Magenta Project is striving to increase inclusion and diversity in performance sailing and to support other women to create change in their industry. Her experience includes being British Sailing Team Meteorologist in the London 2012 and Beijing 2008 Olympic Games and more recently as navigator on board Team SCA in the Volvo Ocean Race 2015-2016, the first all female team in 12 years. The team benefited from the skills of Helena Lucas who won gold at the Paralympics in 2012 and was later made an MBE. The crew also featured Mary Rook, who won World, European and national titles in her glittering career that additionally included being selected for the British Olympic Sailing Team. In the sailing community the former farm girl is well-known for her work ethic, famously upping her workout schedule to match the fittest men on the team. HFRS’s Inclusion and Diversity Manager Leanne Illman said: “We are so proud of our first all female crew, just by taking part they epitomise what inclusion and diversity is all about, but to win is just incredible. “We want our female staff to feel empowered and to believe there are no limits to what they can accomplish, and the HFRS Magenta crew are a shining example of just that." The Hampshire team included Amy Beams, Charlie Ashman, Dalvinder Rai, Jill Horn, Katie Loates, Jo Chaplin, Lucy Robinson, and Ann Christin Olsen-Haines, as well as Maisie Rudkin form West Sussex Fire and Rescue Service. The 14th annual event took place at Sunsail Port, Solent, Hampshire, from 8 to 11 May and involved 260 emergency service personnel from across the country along with friends and family. Magenta was one of five HFRS vessels in the challenge, with another fire service boat placing third overall and also second and third on the passage race home. The aim of the voyage was to raise the profile of The Magenta Project which promotes women as professional sailors and creates positive female role models. The Magenta crew also won a charity donation which has been donated to the Magenta Project. The event has raised more than £80,000 for good causes since its launch. Event creator and retired HFRS officer Mick Stead also received a special Fire Sport Meritorious Service Award on his last event after 13 years.